Graffiti on your Denver commercial space is the absolute worst. It not only looks horrible but can have an incredibly drastic effect on the community reputation of your building. When it comes to elevator graffiti, which occurs on metal panels, it is even worse. Not only is it worse because of the incredibly high expense of having your elevator’s panels removed, replaced and/or restored. It is further devastating because often times, this type of work takes weeks to remove and your elevator is sometimes, never the same again. So when your Denver investment property gets struck by graffiti, what you need is a fast, cost-effective solution to save you not only money but your reputation too! Read about Greenlight Window Films incredible film solutions for metal graffiti below. As mentioned, the key to not letting graffiti ruin your Denver’s building’s reputation is getting it off–and fast. There simply is no faster way to do this than with a revolutionary product called Metal Shield. Metal Shield, is a thick (6-mil) metallic film that works as graffiti abatement and obscuring film. IT is installed over your elevator’s marked metal surfaces, replicating its original, clean appearance. The best part is, even if the film is marked again, the film is easily and cost-effectively removed and replaced. How Long Does Metal Shield Take To Install? 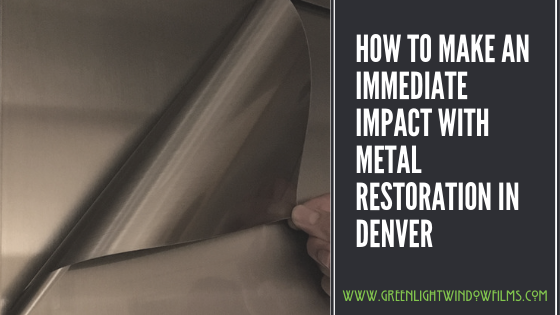 One of the best features of Metal Shield is it is fast to apply–nearly all our elevator graffiti removal jobs here in Denver are done in as little as one day. Will Metal Shield Match My Elevator’s Metal Finish? How Much Does Metal Shield Cost? Many factors affect the cost of Metal Shield and Metal Shield installation from the finish, to extent of damage, to the area on which it is being applied. However, one thing that is categorically true is–metal shield costs about one-tenth of the cost of traditional metal graffiti removal, which can get really pricey really fast since it involves full panel replacement and/or hours of sanding.